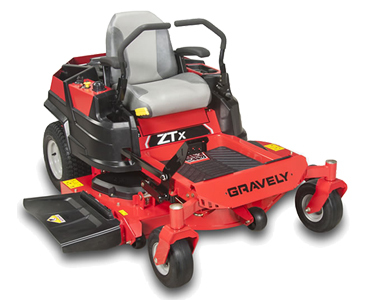 A professional cut, comfort, and stability are provided with every mow using the Gravely 52 inch ZT X Zero Turn Mower that is powered by a Kohler 7000 Series for all the cutting power you will need. The 52 inch fabricated cutting deck maximizes air flow to deliver a exceptional cut with every mow. The best in class Height of Cut Selection Dial offers an impressive 13 cutting steps ranging from 1.5-4.5 for the perfect cut every time. The Hydro-Gear EZT transmission offers unparalleled control while reaching speeds of up to 7 mph to get your job done quickly. And, maximize operator comfort for all day mowing with the high-back seats, adjustable levers, a floor mat, and arm rests that provide all day comfort. 52 inch Fabricated Cutting Deck: A professional grade cut is available using the best in class Height of Cut Selection Dial, located near the operator's position, to choose from 13 different cutting heights ranging from 1.5-4.5 inches. The 52 inch fabricated deck is designed for maximum air flow to provide an optimal cut every time. Lower the blades from the operators position using the electric Warner blade engagement and lower/raise the deck with a convenient foot-operated deck lift. Adjustable Control Arms: For more comfort the the control arms can be adjusted in three different locations and flipped out for easy entry and exits..
Click the button below to add the Gravely ZT X 52 inch 25 HP (Kohler) Zero Turn Mower to your wish list.